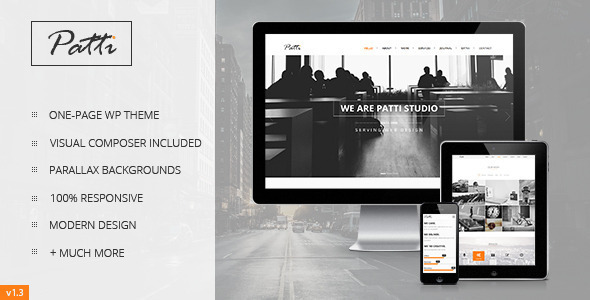 Patti 1.3.1 newest version : Released on April 21st, 2014. Responsive from Head to Toe – Patti is built on a responsive framework which transforms the layout of your website and makes it look great starting with small screen devices, to the impressive fullscreen monitors, by changing its shape from 240px to 1120px. FullWidth elements look also amazing. Drag&Drop Backend-Frontend Page Builder – Patti comes packed with the “Visual Composer” Premium WordPress Plugin($30 value) which allows you to create awesome pages for your website within minutes. As a bonus, we added the Templatera($10 value) addon, so you can quickly set pages and manage builder templates with ease. Impressive Media Slideshows – Create responsive, SEO friendly and unique sliders for your pages by using the “Revolution Slider” Responsive WordPress Plugin($15 value), directly from a cozy admin panel packed with options for anything. Regular, Fullwidth or Fullscreen, image or video, the plugin can handle it! Easy Theme Setup – Prepare your website for web within minutes by importing the demo data XML files packed with the theme. The package also includes slider and builder settings, ready to be imported into the system. Parallax Background Effects – Beautify your website and make it look more appealing by using fullwidth backgrounds with parallax-like effects for any content section. They`re easily managed directly on the page, via the page builder. Start creating a long-lasting impression for your prospects. Extended Options for Pages – Each page can be extended with a set of options. Set a custom layout: sidebar on left, sidebar on right, fullwidth page. Set the sidebar. Choose a header style and customize it for your needs. Define a background, being it image or color. Typography based on Google Fonts – The theme is using the Google Webfonts service to deliver the font styles on the front-end. Customize the look of your website by choosing from more than 600 Google Fonts for content and headings, directly from the admin panel. Video Tutorials – Setting up the theme is a breeze, but it gets a lot more easier with the Video Tutorials series, specially prepared for Patti. Learn how to install the theme, build sections, pages and menus and make your website live in no time! Free Support & Updates – Customer`s needs come first. That`s why we offer 100% free support and lifetime updates. Answering your questions, guiding and helping you is a top priority. Need a feature that`s not yet implemented? Just let us know and we`ll take care of that with an update!